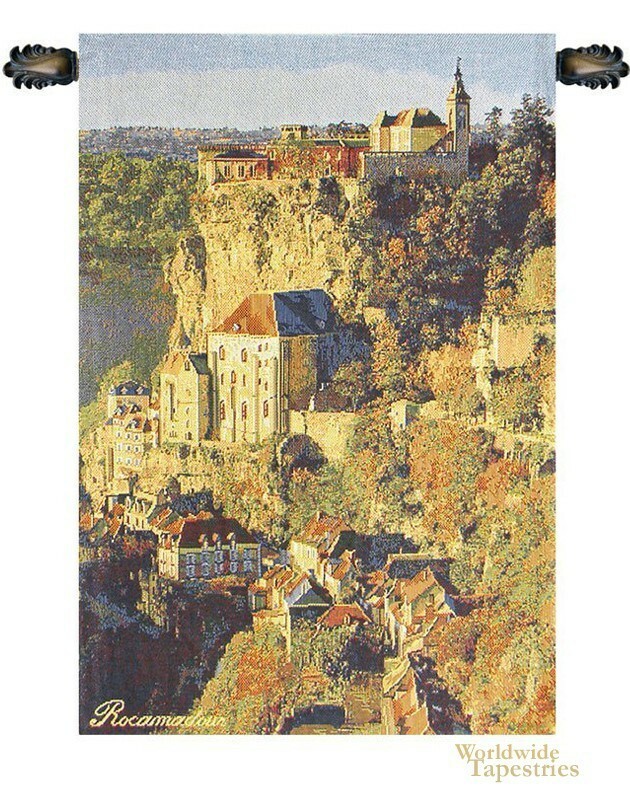 This landscape tapestry shows the South western French commune of Rocamadour. The name of the region, according to legend, was named after the founder of Saint Amator, which was where Zacheus the tax collector of Jericho in biblical texts. He was also the husband of St Veronica, who wiped the face of Jesus on the way to Calvary. The buildings here are perched on the side of a cliff overlooking a vista of the surrrounding region and the River Dordogne. The architecture of the village, including its chruches and monastic buildings on the top of the hill and the town below,is beautiful and in harmony with the surrounding rocky hillside and trees. The region, for its scenic beauty, and its biblical associations, is a location of tourism and pilgrimage. This tapestry "Rocamadour" is backed with a lining and has a tunnel for easy hanging. Note: tapestry rod and tassels, where pictured, are purchased separately. Dimensions: W 13" x H 19"